River Raid was an action-packed, overhead scrolling shoot-em-up which was created by the first female video game designer, Carol Shaw. This wasn't her first commercial game, though, as she had previously created 3D Tic-Tac-Toe for the Atari 2600 in 1979. 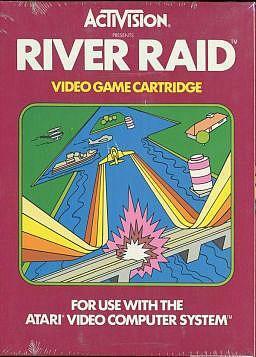 River Raid was first published by Activision for the Atari 2600 console, before being ported to the Atari 5200, Intellivision and Colecovision consoles and 8-bit home computers. The player controlled a fighter jet (which could move left and right only) and scored points for shooting enemy helicopters, tankers, jets, bridges and fuel depots. Later ports of the game (such as the Atari 5200 version) also included hot air balloons and enemy fire from the river banks. Refuelling involved flying over a fuel deot. Overall, there was very little enemy fire in the game and the random number generator used in the programming made for more unpredictable movement of the enemy. 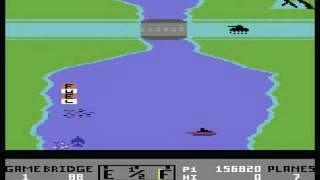 River Raid is a truly classic game, and I remember spending way too many hours playing this one on my Atari 800XL. The concept is very simple - you shoot just about everything on the screen - but there was an addictiveness to the game that is hard to find in many modern games. Your only goal was to try and get a higher score than the last time you played, but the fact that your aircraft was very responsive and you could keep playing unlimited levels (until you lost all your lives) made this a real winner. 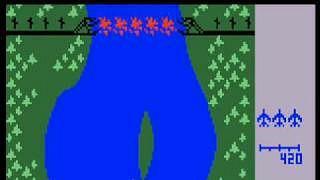 The responsive and almost unlimited gameplay made River Raid, quite possibly, the best game ever released for the Atari 2600. You can see more videos and read more about the game further down the screen. The 800XL version plays very much like the 2600 version, although I don't think the plane is quite as responsive. However, it has improved sound effects and graphics as you would expect with a superior machine.